"Meet Os. A Straight Up Ghost Assassin." Dark Sky Films has released a trailer for a horror comedy titled Another Evil, about a wacky ghost exterminator named Os who is hired to get rid of a ghost in a summer home. Steve Zissis (from "Togetherness") stars as Dan, the guy who moves into his family's vacation home and encounters a ghost. The cast includes Jennifer Irwin, Mark Proksch as Os, Dan Bakkedahl, Dax Flame, Steve Little, and Mariko Munro. This looks very fun, I'm glad that we finally get to see another comedic take on haunted house and ghost exterminators (one of the only other ones I can think of is The Frighteners). It feels like this would be a nice double feature with What We Do in the Shadows. Have fun. After encountering a ghost in his family's vacation home, Dan (Steve Zissis), a modern artist, and his wife Mary (Jennifer Irwin), hire an "industrial-grade exorcist" named Os (Mark Proksch) to get rid of the beings. But Dan soon realizes that ridding the home of evil won't be as simple as it seems. 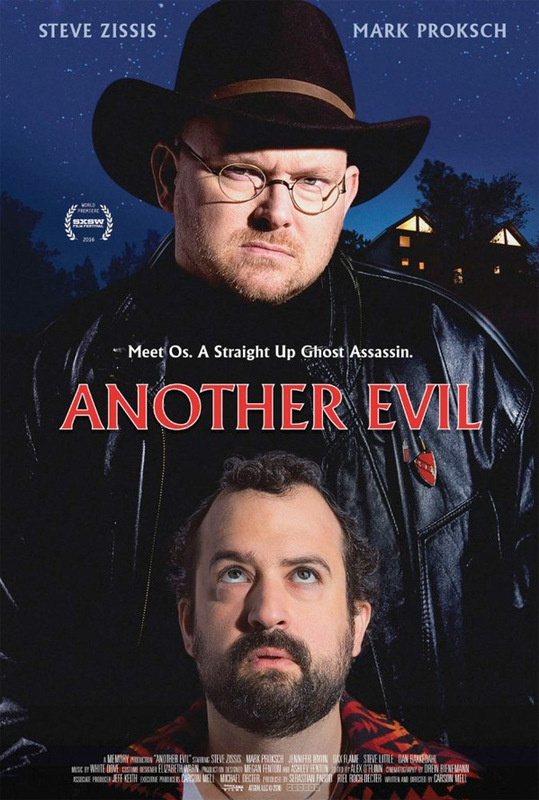 Another Evil is both written and directed by filmmaker Carson D. Mell, a co-producer on "Silicon Valley" making his feature directorial debut after a few other short films previously. This first premiered at the SXSW Film Festival last year, and it also played at BAMcinemaFest, as well as the Seattle, Fantasia, and Denver Film Festivals. Dark Sky Films will open Another Evil in select theaters + on VOD starting May 5th this spring.